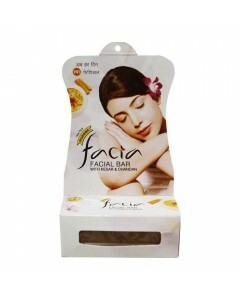 Facial is now possible with Facia Facial bar. Adorned by a beautiful fragrance, this velvety, hydrating, foaming cleanser penetrates deep in the skin resulting in gentle removal of everyday wear and tear effectively, retaining essential moisture and leaving your skin lustrous after every wash.Combining richness of Ayurvedic herbs like Kesar, Chandan, Aloevera, Camphor with the goodness of Fruitamins. Facia ensures a healthy, glowing and beautiful skin. The unique formula is perfect for all skin types and is suited for both men and women.